맘스터치 처음 먹어보는 외국인들의 반응!? 지난번엔 매운한식을 도전하고 이번엔 외국인들도 먹기 쉬운 한국 패스트푸드 왕중왕전을 해봅니다!! 맘스터치, 롯데리아, 맥도날드, 이삭 토스트… 어떤것이 외국인 입맛에 제일 맞을까요!? 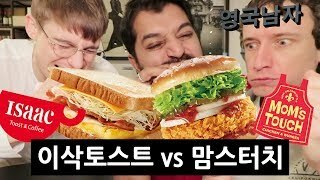 After an intense Korean Spicy Food experience, we go for something a bit more familiar this time round, Korean FAST FOOD!! Of course we have to see what is different at Mcdonalds over here, but on top of McDs there's also Lotteria, and the incredible "Mom's Touch", as well as Ollie (and his dad's) personal favourite, Isaac Toast! !